Waikiki Park Heights #1707 - RENOVATED! Nice Ocean View, central A/C, quick walk to beach! Sleeps 3-4. RENOVATED! NEW KITCHEN, APPLIANCES & FURNITURE AS OF 9/1/17! Enjoy the comforts of home and beautiful ocean views from this beautifully renovated one-bedroom condo (488 square feet plus ocean-view balcony/lanai with table and chairs). A long hallway separates the living area from the bedroom with its NEW Queen platform bed (9/2017) and black-out curtains. - New large walk-in shower stall (no tub) with hand-held shower wand. This non-smoking accommodation sleeps 3 adults or 2 adults with 2 small children. Great place for two people. Near to the beach and with an beautiful view of the ocean. Barbara, the property manager, was always responsive and very welcoming. We loved our stay and we would love to be back to Waikiki and stay at the same place. So good I booked again for next year!! Mahalo, for the lovely review and for choosing to stay with Captain Cook Resorts during your recent visit to Hawaii. We're so glad you enjoyed your stay and pleased that you booked for next year! We look forward to welcoming you back! We had a great stay in this little apartment. Its in a fabulous location a block back from the beach with view of same. Living area is very small so you have to fold the sofa bed back up each day but certainly manageable. Bedroom is on quiet side of the block although this apartment is directly opposite the lift and that does start whizzing up and down from about 6am so can disturb those who like to sleep in. Large grocery store 5min walk and a variety of food trucks next to that for an easy take away feed. Lovely clean and fresh pool decent size for a nice swim. Would definitely come back and stay here if in Honolulu again. Mahalo for choosing to stay with Captain Cook Resorts and the great detailed review and recommendation! We're so glad your visit was enjoyable and look forward to seeing you again. We had a lovely stay in the apartment - it is close to the beach, restaurants and shopping but also very quiet and safe. Mahalo, Gerald! We appreciate the positive feedback and pleased you enjoyed your stay in this great condo! We will look forward to your next visit! This is a small, but very comfortable condominium unit in a great, quiet location with beautiful ocean views. I would recommend it for a maximum of two guests. It is very clean, well provisioned, has a nice big shower, and a very comfortable bed. Although we had a car, we rode the bus a few times, and the bus stops are very close to the building. It is also close to the beach and a grocery market. My only criticisms are that it lacked a comfortable chair in the living area with arms to sit in and the garage parking stall assigned to this unit was tiny and against a wall that made it almost impossible for the driver to get into and out of the car. Also, I thought the price of parking was excessive. The woman who handled my reservations (Lauri Clark) was very friendly and efficient, as was the woman who checked us in (Barbara Sanderson). All in all, I can highly recommend this reasonably priced condo unit as a perfect place to stay in Waikiki. Mahalo for the detailed 5 star review! We are so glad you enjoyed the beautiful ocean views and convenient location of this great condo. 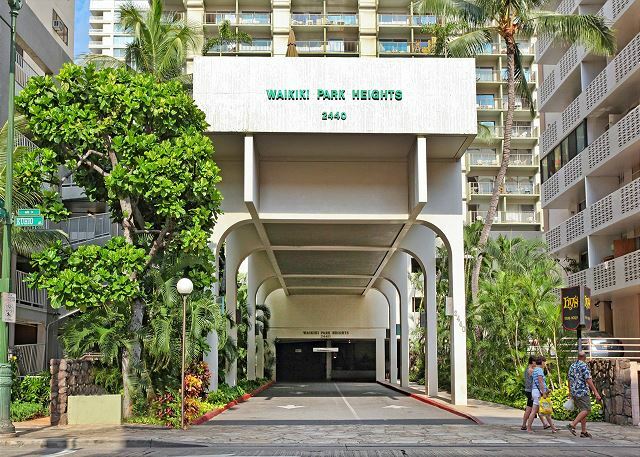 Parking is at a premium in Waikiki and does not come with the units at Waikiki Park Heights. The cost of parking at Waikiki Park Heights is very reasonable compared to most other locations. Many Parking spaces in Waikiki only accommodate smaller cars and spaces can be tight, we do apologize you had this experience with your parking, but sometimes it cannot be avoided. We look forward to welcoming you back on your next visit! P.S. We think Lauri and Barbara are super to work with, too! The unit is somewhat small but very comfortable for TWO people. Using the couch-bed for more than two would severely restrict the size of the living space. It was clean and well maintained, although the AC and bedroom light needed repairs when we arrived; each taken care of in a timely manner. Property manager (Barbara) was always available for any unit-specific questions or problems. Towels and linens are supplied. Fully functional kitchenette with plates, cups,utensils, and drip coffee maker. 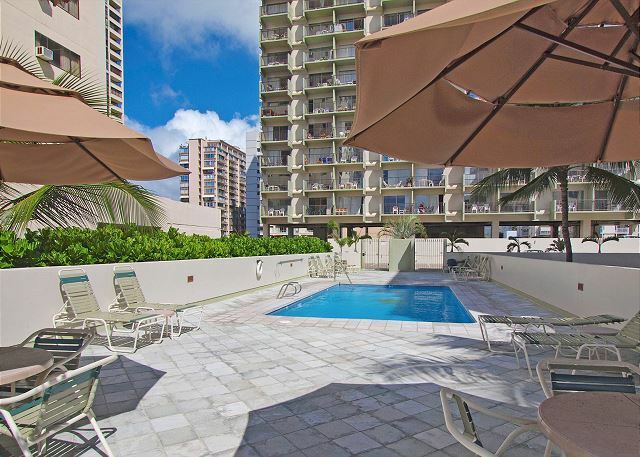 Easy walking distance to Waikiki beach and to the many places to eat in the near area. It is very close to the Hyatt Regency where many of the tour companies have a transportation pickup location. You must supplement the toilet paper if you use all that is provided. Best places to sit-down eat..Cheesecake Factory and Dukes Lane Market & Eatery (Basalt restaurant); best beer selection, the Yard House, the VERY BEST sorbet/gelato place, Glace, near the Yard House on Lewers St.
Aloha! Thanks so much for leaving such a wonderfull and detailed review. Happy to have provided all of the needs you required for a wonderful vacation! It's what we're here for! Hope you can enjoy a return trip to our beautiful islands soon! It is more than I expected! I could see the sea well!. It was more than I expected for a nice room and location. Aloha and Mahalo for the wonderful review! We are pleased that your stay was enjoyable and we exceeded your expectations! 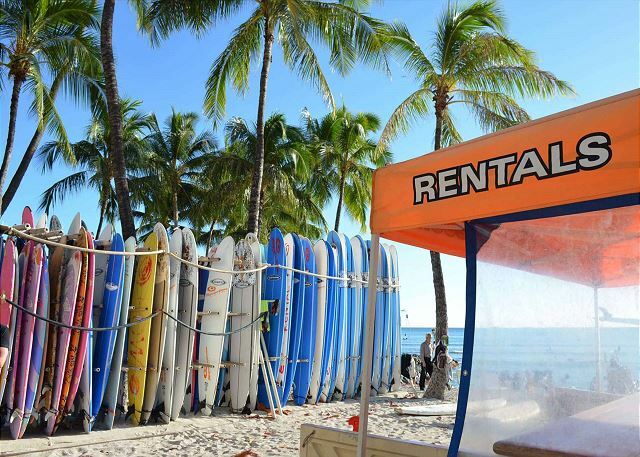 We look forward to seeing you again on your next visit to Waikiki! Nice apartment, close to shops, restaurants, beach. Everything!!! Had a great stay at this apartment, found the location great close to everything you will need. Short stroll to beach, bus stops and shops making this place real convenient. It can be a little noisy at night being at the centre of it all but that was ok for me. The apartment it self was clean and tidy, well stocked with things that you will need. Plus nice balcony to sit a chill. Watching the surfers do their thing. Bed was soft and comfy and Sofa bed was comfortable as well. I would recommend a stay here. Mahalo for posting a a great 5 star review and recommendation of your recent stay! Hope to see you back on your next visit! Very well located property . Barbara at checkin was very friendly and helpful. Property was very clean and tidy. Some door lock maintenance is needed. Loved the whole island. Would use this property again. Mahalo for the review and recommendation! So glad to hear you enjoyed your Holiday in this great condo! Thank you for alerting us to the lock maintenance issue, we will address it immediately. 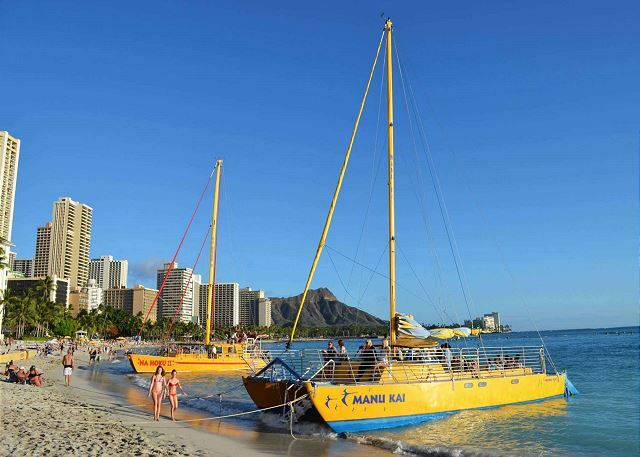 I will pass your feedback on to our team and we look forward to your next visit to Waikiki! We loved the location of the property, just two blocks from the beach amongst restaurants, shopping, the zoo, and a beautiful park. The property manager was lovely and so helpful and Captain Cook Resorts were very professional and excellent communicators. I would highly recommend this property. Mahalo for choosing to stay with Captain Cook Resorts and the great review and recommendation! We're so glad your visit was enjoyable and we are delighted that you appreciated the convenient location of this wonderful condo! We think Barbara is amazing to work with too! Hope to see you on your return visit! A bit smaller than previous at four paddles, a bit slower pace. For next year would prefer four paddles or a condo closer to Imperial Embassy or Wyndam resort. Other than that all worked ok.
We had an awesome holiday. Communication with Captain Cook was always prompt and accommodating. The apartment was as depicted in the photos and we were not disappointed. It was awesome to be able have either breakfast or sun downers on the deck and enjoy the view. Barbara was great and sorted out any issues straight away. The short stroll to the beach was a huge plus. We didn't use the ABC stores, but made good use of the supermarket a few blocks away. Best pub by far was Dukes - although the Mai Tai bar ran a close second. If you want a really good meal at a quality restaurant - Alan Wong's is superb. Busses run on your street - 2 & 42 get you to Ala Moana really easily and 23 to Diamond Head. Buy a bus pass for $5 it is worth it. Aloha! Thanks so much for leaving such a great detailed review and recommendation. Happy to have provided all of the needs you required for a wonderful vacation! It's what we're here for! Hope you can enjoy a return trip to our beautiful islands soon! Mahalo, for the review and recommendation. We appreciate the feedback and will look forward to your next visit! Doesn't have the common property ammenties of a hotel, but is very comfortable with good features like a kitchen, separate bedroom, bright airy living area and good views of the ocean.Very helpful staff. Mahalo for the 5-star review and recommendation. We appreciate the positive feedback and hope you are able to plan a return trip soon! Overall great place to stay! Mahalo! So glad to hear you enjoyed your stay! We hope your future travels do include another visit! See you then! From making the reservation and to being met and taken to the unit was faultless.Previously stayed in the complex. Cannot beat the view/balcony and location.Would definitely stay again. Thank you. Mahalo Chris, so glad to hear you enjoyed your stay - we are dedicated to offering great accommodations and service, and we're so glad your visit was enjoyable. We appreciate your return business please ask about our return guest discount when booking your next visit! Perfect location. Great view and very clean and in good shape. Management staff was helpful and kind. Couldn't have asked for a better situation. Mahalo, Sharon! We look forward to your next visit! It was very nice & accommodating. All appliances worked properly & the central a/c wise very nice, but not too necessary because cool air flows thru the unit like being in a wind tunnel. The view was spectacular! And Barbara was so very nice & very considerate. Highly recommended. ???????? Mahalo, Floyd! Hope you can visit us again soon! Barbara was very professional, helpful and answered all our questions. We loved the condo we stayed in. Mahalo, Andrew! We appreciate the feedback (and the recommendation!)! Our stay at the Captain Cook, in Waikiki, was very comfortable, relaxing, and stress free! This room was very cozy, perfect for the two of us. We enjoyed the salt water pool, the view from the lanai, and the quiet atmosphere. Our property manager was very professional and efficient and readily available, if needed. This is a perfect location to the beach, shops and restaurants. We would definitely stay here again! Mahalo, Diane! We hope you're able to visit us again soon! Although this stay was work related, I'm very glad I had the opportunity to stay at this location. The accommodations were more than adequate with a pretty good view of Waikiki beach from the balcony. I special thanks to Barbara for providing a great welcome and explanation of the area. Mahalo, Charles, for the great review and recommendation. Hope to see you again! Bed room, big shower and kitchen with good equipment.The sofa bed was not a good choice specially with two adults (smaller kids may be ok) but as they are slepping in the leaving room - kitchen plan to only cook breakfast not more. We have been asked to change 3 times parking space, easy to manage but better if it can be avoided. Mahalo for the review, Sylvie! We apologize you had to change parking spaces... parking does not come with the units at Waikiki Park Heights and since parking is at a premium in Waikiki, switching parking spaces sometimes cannot be avoided! We stayed for 7 days at 1707 Waikiki Park Heights. This was our first time in Hawaii. Barbara was very pleasant to deal with upon arrival. My first overall thought was this is smaller then it appeared in the photo but exactly how it looks in the photo. No surprises here! After a good night sleep on a very comfortable bed we were ready to start the day exploring and were thrilled at how close his place is to EVERYHING! The staff at the building were always kind and friendly. We had more bedding brought to us in the morning and had mentioned we only had two pool towels and as promised we had two more delivered by a very friendly lady. The red sofa- if you read the reviews I think most say it is uncomfortable and this is true! Our two teenage kids who have slept on many sofa beds said his was very uncomfortable. But it didn't take away from our holiday, we had a wonderful time and had a nice place to call " home" for a week! There is stuff in the closets to take to the beach you just need to look. I think people may leave a few things behind for others to enjoy and that is always a nice discovery, so you don't have to spend money there, look what is in the closets! So would we stay here again- absolutely but only two of us not with the kids. Mahalo for the review, Candis! We're glad to hear your family enjoyed their stay and the services provided by our staff. We hope you are able to plan another visit soon! Although the condo is small it was wonderful for our family (2 adults and children). The sofa bed was large and our girls (14 & 16) slept comfortably on it. We slept great in the queen bed. The condo was very clean and had plenty of linens and towels. The view from the balcony is off Waikiki beach and the ocean - BEAUTIFUL! It was quiet and peaceful. We'd definitely rent it again! Mahalo for choosing Captain Cook Resorts for your family vacation, Cheryl, and for the great review and recommendation! We're so glad your visit was enjoyable and look forward to seeing you again. Came back to this same building/agency after previous good experience this summer. Clean and functional apartments with minor maintenance issues (e.g., TV remotes may not work). Great location and view of the ocean. I am very happy with the vacation rental; everything was as described on the website and was in fact larger than I expected! The unit was spotless, bedroom was quiet, and the family room/kitchen area surprisingly usable and "larger" than the photos depict. The bathroom was OK, it could use a door for more privacy. The shower was huge and great for cleaning up after the beach. The unit was more than adequate for my family of 3 (2 adults and 1 toddler). 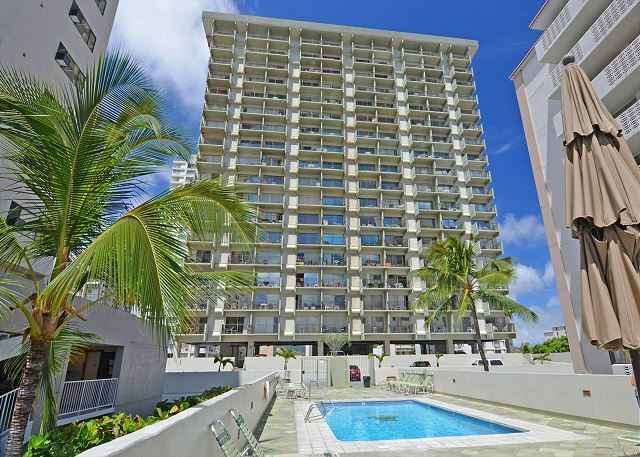 The condo is in a very convenient location of Waikiki. 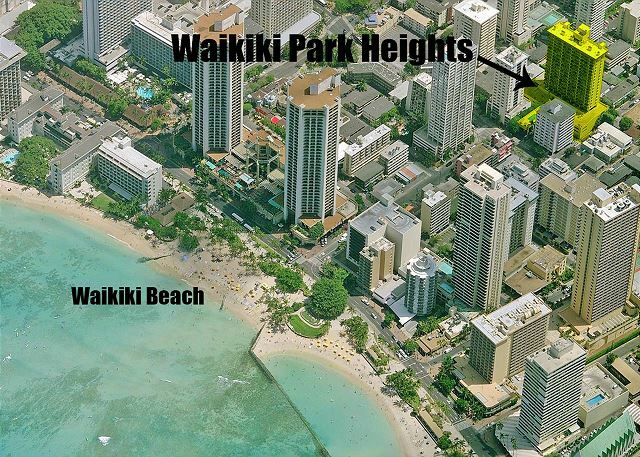 Waikiki Park Heights is only 2 blocks to the beach, several other hotels/restaurants are in the area. Parking in this condo is fantastic by Waikiki standards - the parking structure is easy to navigate and the spots were HUGE. 1. The unit could use a more comfortable sofa, although it's not a big deal for us since we did not sleep on it. 2. Satellite TV/Digital Cable - would be nice to get some premium channels, but I'm just being picky here! 3. Toilet seat has a few rusting bolts that should be replaced to keep up appearances. I'm very happy with the rental and would recommend to others. Captain Cook Vacation Rentals was very professional and easy to deal with too. Looking forward to returning to Honolulu and using your service again. We enjoyed our week stay here at Waikiki Park Heights while on our honeymoon. We loved everything about this unit, especially the location which is closer than the pictures make it seem. I would have to agree with other reviews that the couch was slightly uncomfortable but the view almost makes you forget about it. We would definitely stay here again! Great location. Good Air Conditioning and ventilation. Good kitchen/provisions, and cleaning supplies. Mahalo for your review . . . and for staying with Captain Cook Resorts! Fantastic stay with a view!! 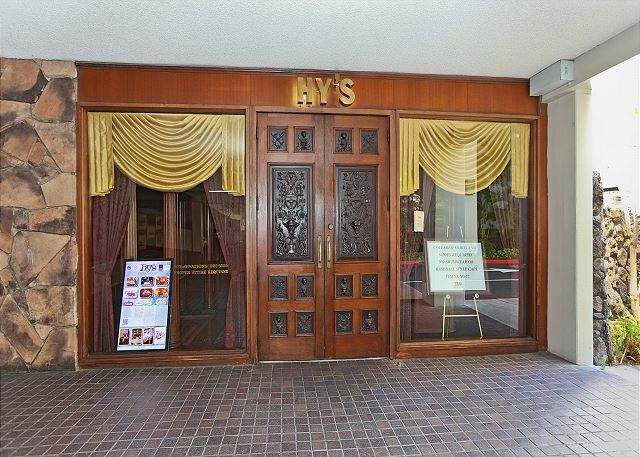 Location is pretty good, near Waikiki beach and many restaurant. We had a wonderful stay at the Waikiki Park Heights #1707! A huge thank you to Leslie and Barbara Sanderson for allowing us a late check-in. We had an amazing view from lanai every morning and evening. The location was central to everything, just a 2 min walk to the beach and right in the middle of all the action of Waikiki. We will certainly recommend Waikiki Park Heights to our friends and family. Very nice location, excellent view of the beach. We had a great stay here. The apartment was close to everything and had a great view of the ocean. Would definately recommend this place to others! This was a very last minute rental for me. In fact I called from the airport when I happened to arrive on the weekend of the marathon. Someone had just left and by the time I arrived they had the apartment cleaned. It's in a great location with a view of the ocean from the balcony, close to restaurants and hotels and well equipped. Thank you guys for helping me out at short notice, the Captain Cook team are professional and a pleasure to deal with. 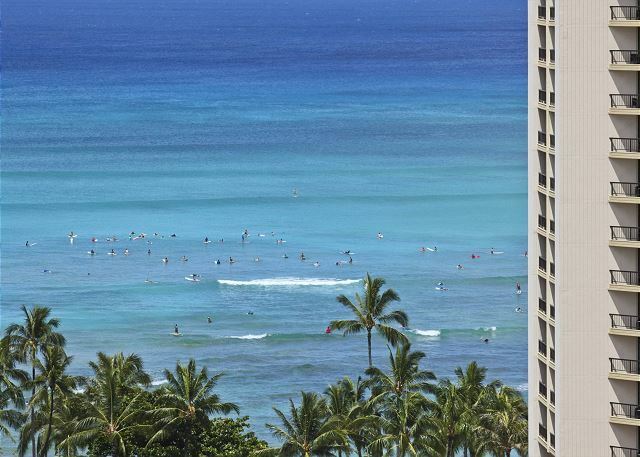 The location was the best, amazing views from the lanai,right in the heart of waikiki, minutes from the waikiki beach. The condo was very clean very comfortable had everything we needed and more. Loved being there. Great place highly recommended. It was just perfect! I will most probably rent this place again on my next visit. Thank you Barbara for being so quick to respond when I locked myself outside after midnight on sunday night!! A great place to stay...made my trip more enjoyable no doubt about it!! 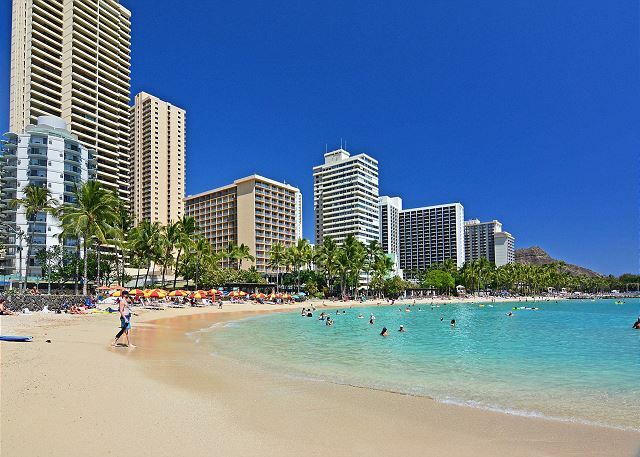 We enjoyed our time at Waikiki, the location of this building is excellent but remember it is near the action so from the lani you have a great view of the ocean and the surfers about 3 blocks away but you also have the constant noise of traffic. The bedroom is in the back so it is quiet. Need new couch in this unit the present one is very uncomfortable. So overall a good time. We were very happy with our decision to take a holiday unit and not the usual hotel stay. We had complete freedom of choice when we came and went. Our unit was very well presented and very well located to all of the Waikiki area. We rated our stay at the Waikiki Park Heights very highly and would definitely stay there again. Close to everything and clean. We had only two adults and baby, so it was perfect size. Security people are friendly, so we felt safe. Would like to stay again! Overall, it was an excellent experience. I loved the view, the location, and the availability of a rental car company in the same building. The "only" complaint I would have is that the bed, while being fine in terms of condition, was too hard for my back, which was distressing. But that's it. Had a great time, and would return again with a bed proviso. Thank you. My husband and kids (8 & 12) stayed in this unit for six nights in mid November. This was our third VRBO in Waikiki. It was by far the cleanest of the three places and most "hotel like" with very little clutter and knick knacks. I was very impressed with the condition of the place, liking the tile floors throughout and large shower. We didn't really cook, but found the kitchen well equipped. There were enough dishes and linens included. The view was very nice and it was a simple straight five minute walk to the beach. The wifi working well throughout the unit. The security of the building was good. In fact, almost too good. You had to insert your key to move between floors which I actually found a bit annoying after a while. There's a front desk/security man on duty at all times. On the negative side, the living space was VERY small. When the futon was converted (it was comfortable), it left minimal room. I think this place would be perfect for two people as we found it a bit cramped for a family of four. We attempted to use the pool once and got in trouble from the security guy. He said "this is the boringest pool in waikiki." the kids were playing and were being somewhat loud but were no means over the top. It did not seem like a kid friendly area and we never went back. Also, the location is great in many ways (close to beach, bus routes, food pantry) but being back the one block from the beach the neighboring area was kind of grubby. I felt safe but didn't like walking past homeless people asleep on the ground on a near daily basis. Overall, our stay was very good. Would we stay again... No because it was too small for four people, pool wasn't welcoming for kids and I didn't like the homeless people sleeping around the place. We had a great time. Great location. Barbara was very helpful. The appartment was clean and well equiped. Would stay in this unit again. This is a great place,and Barbra is always very helpfull. This was our third time staying there and we will be back. I was a little surprised at how small the living/dining/kitchen area was, but since I was traveling alone, it was just fine. The A/C wasn't working when I arrived, but Barbara got it fixed right away (on a Sunday!). Also, I needed to extend my stay at the last minute. Barbara, with very little notice, promptly accommodated the change. The building is well-maintained as is the unit itself, and the neighbors are very quiet. I grew up in Hawaii, so I expected to see at least one roach in the condo; I didn't see a single insect there during my 11-day stay. There is a slight amount of traffic noise from Kuhio Avenue, but I couldn't hear any of it in the bedroom. I was in Honolulu visiting relatives, and the location was perfect for that.